Dr. Moir has illustrated a clear vision of the advantages that address environmental issues on a broad scale in his initiatives with the Ocean River Institute. In 2007, he directed public outreach, education and civic engagement to raise public awareness of the need for comprehensive ocean management in Massachusetts. A reception was held in Boston’s State House where 47 ocean-related nonprofits tabled inside and a table outside on the street was manned by Culver MA high school students. This effort supported the Governor and Legislators enacting the Massachusetts Ocean Act in 2008. 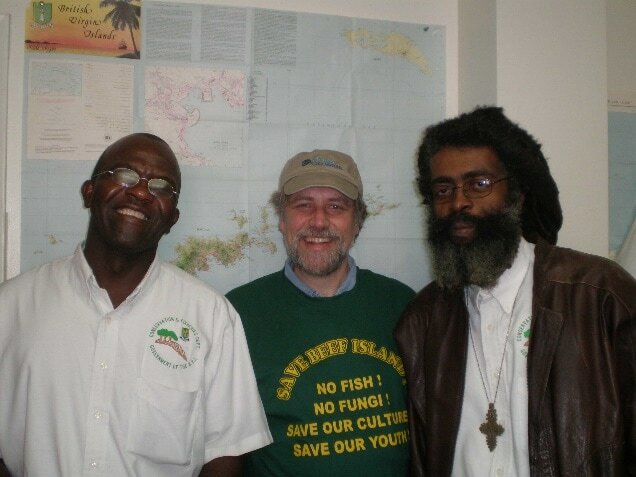 The Ocean River Institute acted as the fiscal agent for the newly formed British Virgin Islands Environmental Council. ORI helped them engage thousands of people from around the world in efforts to protect the islands’ fragile ecosystems: fishery protected area, salt ponds and mangroves. The Ocean River Institute was a lead in a national campaign for collaborative ocean management across all federal authorities, involving at least 6 departments of the federal government and dozens of federal agencies. In 2008, President Obama by executive order created the National Ocean Policy. In Boston’s historic Faneuil Hall senior officials from the Department of Interior, Department of Commerce, the Coast Guard, and the Navy stood up and announced they would work together collaboratively on ocean-related management areas. A coalition of recreational anglers and charter-boat fishermen, and the Ocean River Institute filed a lawsuit in April 2011 that asked the National Marine Fisheries Service (NMFS) to consider protections for severely depleted river herring, shad, and sea herring – the key links in the food chain for the Northeast’s ocean ecosystem and fisheries. U.S. District Court found that the NMFS acted illegally in approving the plan put together by the New England Fisheries Management Council known as Amendment 4 and tossed out the entire amendment. The fishery council is today taking a more ecosystem-based management approach respecting the importance of forage fish leaving sufficient numbers for striped bass, bluefish, tuna, whales and birds. Forage fish work is ongoing. On February 7, 2017 when wind driven snow slashed across Plymouth Harbor, the fate of a small silver fish and a fishery was being decided at a meeting of the New England Fishery Management Council’s Herring Committee. Dr. Moir called on the fishery council to take the precautionary approach in amending the herring plan, to support year-round closures to mid-water trawlers extending 50 miles from shore. This is the only alternative under consideration that protects all identified river herring hotspots where sea herring and river herring school together. Don’t overfish our silver darlings! In 2010, 48 dolphins died in Indian River Lagoon, and the year before the death toll was 43. Outside of the lagoon, beyond the barrier beach, lived a pod of dolphins that seemed to be doing just fine. In the Lagoon, massive summer algal blooms made the Lagoon waters so dark that seagrass was dying off at an exceptional rate. On the backs of lagoon dolphins could be seen eruptions of skin-eating fungus. The blooming algae was a stress and then disease finished off individual dolphins. The next year manatees were found dead having attempted to eat seaweed instead of seagrass. Partially to blame for the algal blooms was fertilizer coming off of established yards during the summer. Floridians are told to spread fertilizer four times a year when three times a year is more than sufficient for healthy lawns. Scientists at the University of Florida reported in 2009 that grass does grow during the summer. To feed the growth they call for the application of fertilizer high in nitrogen and phosphorus. They neglected to note that, unlike the turf soil in the laboratory, Florida soils are naturally high in phosphorus and sufficient in nitrogen. Captain Nan Beaver of Sunshine Wildlife, an O.R.I partner organization, and Rob Moir met with the Martin County Commissioner. The Commissioner remarked that he was getting complaints of grandchildren encountering slime on private beaches. Would he do something about that? We asked the Commissioner for just three lawn care actions: 1. respect the setbacks, do not fertilize too close to waterways; 2. use some slow-release nitrogen fertilizer and 3. do not fertilize lawns during the summer months. The summer is when the waters are warmest, daylight the longest and when algae hungriest for nutrients to bloom. Summer is the rainy season and rinsing nitrogen off lawns at this time is polluting Indian River Lagoon. The commission came back with a rule respecting setbacks, use at least 50% slow-release nitrogen in fertilizers, and do not spread fertilizer on established lawns June 1 through September 30th. The ordinance was voted in unanimously by the Martin County Commissioners. The backlash from industry was fierce at all levels, town, county and state. Many groups organized and came together rallying for a summer ban. Take a summer holiday from fertilizer applications and save money while maintaining green grass. It took five years of concerted efforts for five of the six counties of Indian River Lagoon to pass responsible lawn care ordinances consistent with Martin County. Today only Palm Beach County continues to fertilize lawns in the summer. Summer of 2016 Palm Beach County suffered the worst algal bloom ever. The Ocean River Institute sent a letter with thousands of signatures and hundreds of personal comments. We asked to show concern for the terrible conditions and stench that established lawns not be fertilized during the summer to demonstrate that home-owners were willing to risk their lawns for the greater good of cleaner waters. There actually was no risk because neighboring Martin County had not fertilized in the summer for five years. ​Claiming insufficient science, Palm Beach County and the Town of Jupiter Island refused to enact more responsible lawn care regulations consistent with every other Indian River Lagoon county and municipality. ​The Ocean River Institute has responded by going grassroots and engaging property owners in Yard Actions for Clean Water. We surveyed garden clubs throughout Florida for recommendations. At the Port Salerno Seafood Festival, we offered ten things to save water and eliminate polluting runoff. Actions ran the gambit from don’t fertilize in the summer, to plants recommended by a garden club to grow between lawns and waterways, to use a bucket instead of a hose to wash one’s car. Families chose from actions and posted their top ten from most important to least important. The underlying message that was heard loud and clear is what one does within confines of private property can have terrible impacts on waterways elsewhere. Clean beaches and healthy wildlife starts at home. Spring of 2015 a Scottish community group called Sea Change invited us to help them save the Wester Ross Marine Protected Area on the Northwest coast of the Highlands including Ullapool and Achiltibuie (photograph) from the dredging of king scallops on ocean floors other than the sandy plains where scallop bury. 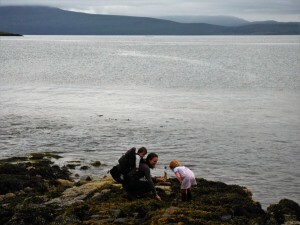 Scallop divers were very upset to find hard bottom rocky shoals and boulder reefs tattered and torn, maerl beds once covered with purple-pink coralline algae shredded and scattered, and four/five-year-old stands of kelp forest mowed down. The Ocean River Institute arrived with hundreds of personal comments from America that made clear our desire for Scotland’s marine life to stay vibrant and alive. The fishing interests made claims that reducing their fishable waters by 2% was the Clearances again where Southerners wished to remove the working folks from the region. The Scottish Cabinet Secretary for Rural Affairs, Food and the Environment was most pleased when he met Rob to receive many personal comments from Americans. 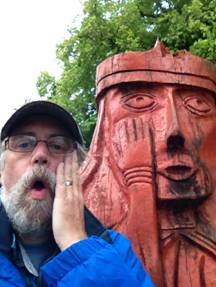 Many claimed Scottish ancestry. Nearly an equal number simply wanted to visit the shores of Scotland and expect it to be full of life when they visit. They all wanted to be sure that the wilds that had inspired George R. R. Martin writing Game of Thrones were still unspoiled. Further research is warranted as actor Rory McCann, known as “The Hound” in the HBO Series, moors his sailboat in Wester Ros (and not in the fictitious kingdom of Westeros). On the 23rd of March 2016 Wester Ros Marine Protected Area was ratified by Parliament and is now protected by law. This means scallop dredgers are completely banned from the protected areas and trawlers are only permitted within the MPA in designated trawl areas. The Ocean River Institute spent a year (September 2016 to September 2017) campaigning for a wondrous ocean place far away from New England’s shore into the Atlantic Ocean on the edge of the continental shelf and beyond. 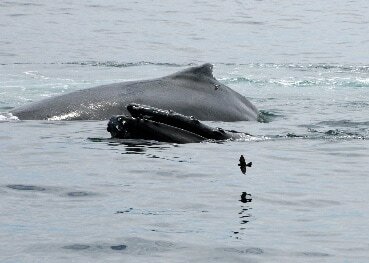 The deep sea canyons are home to sperm whales that dive deep for squid. Further out are four seamounts that ascend 8,000 feet up from the ocean floor and are still more than 1,000 feet below the surface in perpetual darkness. Each seamount is different; each has vast assemblages of unique animals, mostly unknown. The seamounts and to a lesser extent the canyons are threatened by deep sea mining of rare-earth elements and high-tech metals that have precipitated out of seawater over the wash of millions of years. High-tech metals highly concentrated in the crusts of seamounts include tellurium, cobalt, bismuth, zirconium, niobium, tungsten, molybdenum, platinum, titanium, and thorium. Tellurium is combined with bismuth in an alloy that is being tested as a next-generation computer chip that is more efficient and immensely faster than existing chips. Tellurium is combined with cadmium into an alloy that is considered the best material for production of multi-terawatt solar-cell electricity using thin-film photovoltaic technology. The solar-cell industry has expressed interest in mining hydrogenous ferromanganese crusts of seamounts. September 2017, President Obama by executive order created and forever protected the Northeast Canyons and Seamounts National Marine Monument. The ocean refuge has also been protected from overfishing. Prohibited are trawling and purse seining for Loligo squid, whiting, and mackerel, and dredging for scallops and shellfish. Out over the seamounts, gill netting and long lining for swordfish, yellow fin and skip jack have been banned. For seven years, lobstermen are permitted to trap lobsters on the ribbon of ocean floor less than 500 meters deep that wraps the northern ends of the three ocean canyons and connects the intervening continental slope waters. It is unprecedented for a national park or refuge for some people to stay and continue to work there. For them, there will be no mustering of a Mariposa Battalion. Dr. Moir continues to strive for excellence in his every endeavor with the organization that seeks to strengthen community involvement in conservation, environmental monitoring and protecting ecosystems.